Although it is now summer 17 of us set out in misty damp conditions on a gentle jog from the car park up to the ruins of the old East Fort. By this time three of our newcomers mistakenly decided to follow Gregg on the short distance run so as they high-tailed it off into the mist Galeen led the rest of us up the side of the mountain along the old manganese mine trail before we turned off onto the 400m contour path round to Blackburn ravine. 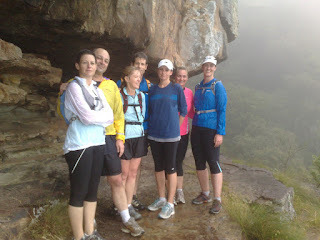 Top photo shows us re-grouping and taking a breather on the narrow path overlooking Hout Bay. By this point Pieter was so entralled by Fay's commentaries on the fynbos he decided to abandon us for the time being and join her walk group which were following on behind us. We continued on the narrow path around the buttress deep into Blackburn gully out the otherside and then down the zig-zags, crossed over the river and on down to the main lower trail. From here it was an easy run back to East Fort down to the road and downhill all the way back to the cars. On the way we met up with our missing newbies who had been directed back to us. our front runner Gregg taking two of the runners from the short distance group with him. we saw 3 Eland in prime condition calmly grazing close to the footpath. We then followed the footpath that climbs up the flank of Kanonkop and onto the site of the old signal cannon. 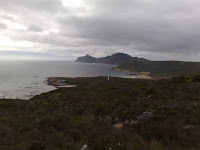 The weather cleared somewhat and we had a hazy view South over Buffels Bay with Cape Point in the distance. Group photo on right of the walk/run group as Gregg and his hares had run on ahead of us and Fay was following shortly behind. resolute and kept going and the baboons reluctantly gave way. Distance just over 9Km with a moving time of 1hr 50min. General consensus was that this was the best route yet. Eight runners found their way to the start at the Kloof Nek parking area despite the wet weather. 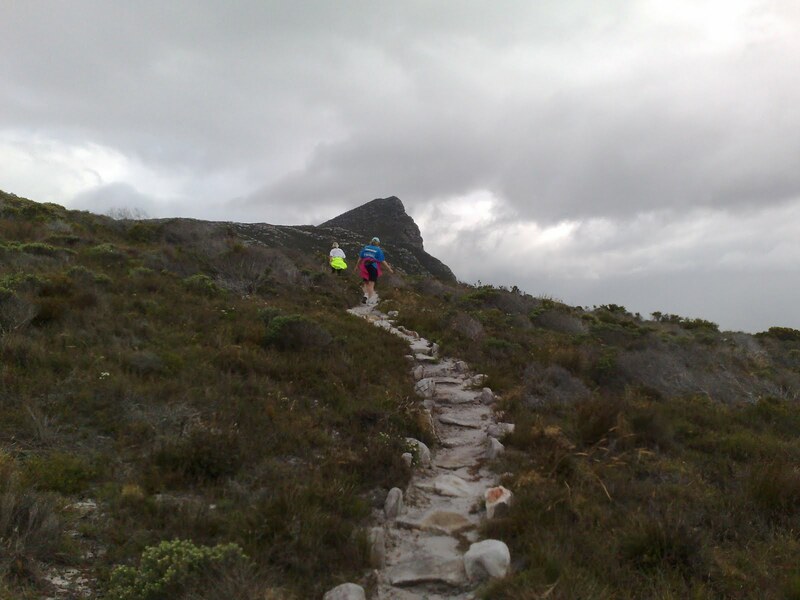 The long haul uphill to the contour path just below the cableway was a little disconcerting for our newcomers but they persevered and thereafter we had a good and uneventful run in the rain and mist along the contour path. Unfortunately we saw nothing of the view over CapeTown and Table Bay which normally is magnificent. Slight navigation error on the way back in that we took the wrong gateway leading off Tafelberg Rd and included an unplanned sightseeing tour of Higgovale before we found the correct path.